How Do Newts Mate and Reproduce? 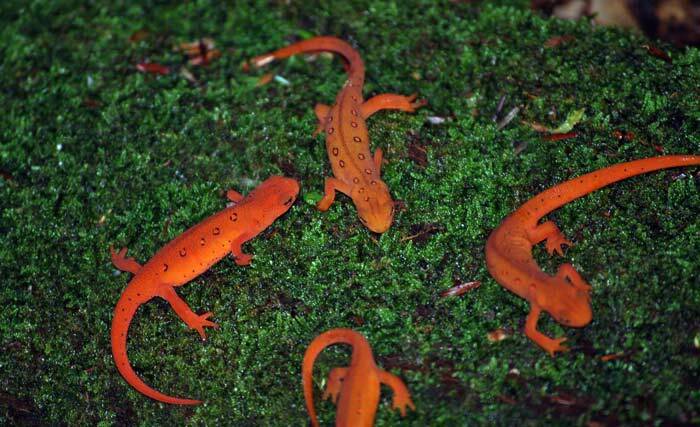 Newts reproduce sexually, with the main breeding season running from later winter through early spring, depending on the species and location. Newts have a fairly involved reproduction with four distinct steps: capture, amplexus, spermatophore and sperm transfer. After the male has found a female, they assume the amplexus position, and then the male leaves a spermatophore on the ground. The spermatophor is a collection of sperm. The female will then walk over the spermatophore and move her body against it to collect the sperm. Female newts lay eggs, and the young are hatched after an incubation period. Females can lay hundreds of eggs in one breeding season.